How to Select The Best Electric Log Splitter? Knowing how to select the best electric log splitter for the money can be difficult. After all, there are so many to choose from for a range of different tasks. Within this buying guide we aim to show you the very best electric splitting equipment, all of which you can buy online with ease. Review each product carefully to ensure it fits in your price range and is the best for your needs. Of course, the work type you’re carrying out can largely affect the choice of splitting equipment. After all, electric log splitters are only suitable for particular kinds of work. This is why it’s important to think about the work you’re looking to undertake and see if the splitting equipment you have in mind will be up to the task. Safety when using any outdoor power equipment is very important. However, it’s even more important when splitting wedges are used. When you’re operating any kind of log splitter, you should make sure you wear safety equipment such as solid footwear, a hard hat, hearing protection, glasses and gloves. This will ensure you keep as safe as possible when the machine is in use. The key to getting the most efficiency from your electric log splitter is by ensuring you use it in the way it’s designed to be used. 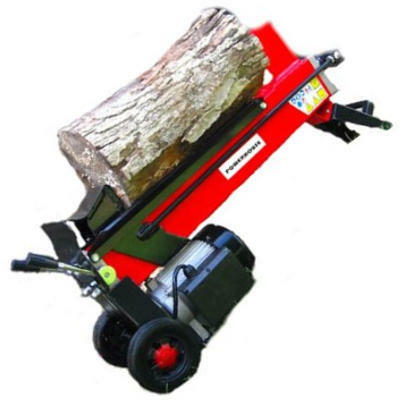 Often, residential log splitters, such as those which are electric powered, produce up to 10 tons of force. If you plan on splitting large logs, you may find the machine is not as efficient as it would be with smaller logs. This may require you to cut the logs smaller before splitting, or opt for a more powerful machine. When you’re looking to choose the best electric log splitter for the money, it pays to make sure you check over the features of each product you’re reviewing. Not all log splitters offer the same features, meaning some machines are easier and more convenient to use than others. Features could include the force provided (in tons), how long the cord is, the extension cord required and its warranty. You may find the warranty provided for electric log splitters is not as lengthy as that provided for gas powered log splitters. Overall, the maintenance an electric log splitter requires is minimal. You simply need to refill the hydraulic fluids (if applicable), ensure the machine is free of debris, and keep it clean. 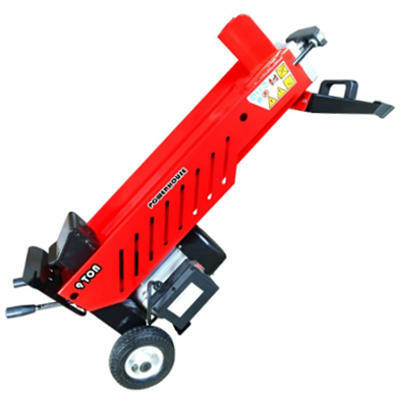 Electric log splitters can be far more affordable than gas powered log splitters. There are also several for sale online at very competitive prices. That doesn’t mean the cheapest is always the best. You should always make a comparison between the price tag and the features list to make sure you’re getting the best deal. It can be operated with one hand. It comes with a generous 2 year warranty. In comparison to the horsepower output, it doesn’t have very much splitting force. It can be difficult to get in touch with the manufacturer if you have any issues with this model. 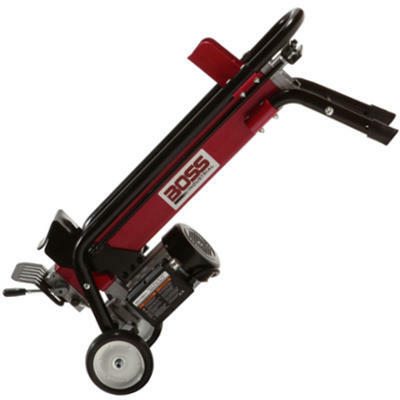 Boss Industrial electric log splitter. Dimensions: 20.5 x 13.5 x 40 inches. QWhat is the overall splitting capacity? QWhat is the cycle time? If you’re looking for a solid, strong electric log splitter that will take care of all those backyard logs with ease, this is the tool for the job. It packs a punch with 7 tons of force, and is durable to last a very long time. It’s very well made with strong parts, and can split several kinds of wood with relative ease. Although it’s not priced overly competitively on the market, you can still pick one up online at a decent cost. 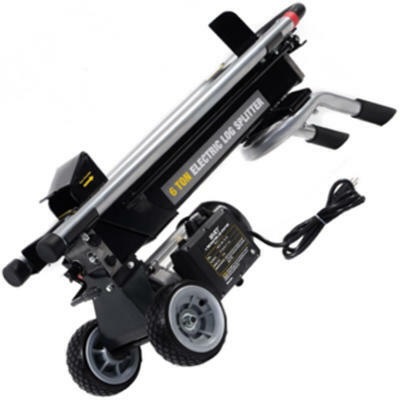 Overall, it’s one of the best electric log splitters for the money and is recommended by many. Check out what other people who purchased this product think about it. Read Boss Industrial ES7T20 electric log splitter reviews. It’s a good machine for cutting wood for wood burning stoves or fireplaces. It doesn’t rust very easily. It can struggle to cut through hard wood, even at the recommended log size. Some parts don’t feel very durable. It’s quite expensive in comparison to its features. Dimensions: 37 x 12.2 x 18.1 inches. QWhat is the log capacity? QHow much hydraulic fluid does it take? If your logs are prepared and don’t require much splitting to fit your log fire, this could be the tool you’re looking for. Unfortunately it’s not the most powerful electric log splitter on the market, but for small logs it’s suitable. Some users also note that it will not split hard logs with ease. This can be a problem as it can almost be quicker to cut logs with an axe. Therefore, it’s certainly not the best electric log splitter for the money. Check out what other people who purchased this product think about it. Read GoPlus electric log splitter reviews. It’s very easy to start. It has a new patented hydraulic system which offers increased torque. It’s very quiet to run. It doesn’t need a noisy air compressor. It can be used inside – on the ground or on a bench. It has a relatively high price tag. It only comes with a 1 year warranty. Dimensions: 116 x 20 x 40 inches. QWhat is the cut length maximum? QWhat hydraulic fluid is needed? ATake note of the serial number and visit your local hardware store. The recommended oil can also be found in your user manual. QWhat wood is it best suitable to be split? AAll kinds. It’s very powerful. If you’re tired of your electric log splitter being picky and choosy with the logs it splits, it’s time to upgrade to the Powerhouse. It’s called Powerhouse for a reason, it really does have a lot of power. With 9 tons of force, it splits most kinds of wood with ease, as long as they fit within the recommended splitting guidelines. It’s suitable for both professionals and homeowners, and is well worth the price tag. For these reasons it’s clear to see it’s one of the best electric log splitters for the money. Check out what other people who purchased this product think about it. Read Powerhouse XM-580 electric log splitter reviews. The hydraulic tank is rust-resistant. It can be operated indoors. It’s very powerful, with more pushing force than several others for sale. It’s very heavy in comparison to other log splitters on the market. It comes with a larger price tag than most electric log splitters on the market. Dimensions: 39 x 41.5 x 88 inches. Splitting Wedge: 1 inch machined steel compound wedge. Splitting Direction: Horizontal and vertical. QWhat voltage is the motor? QWhat kind of wood can it split? When you require unparalleled power and a job done quickly, this Swisher electric log splitter is for you. 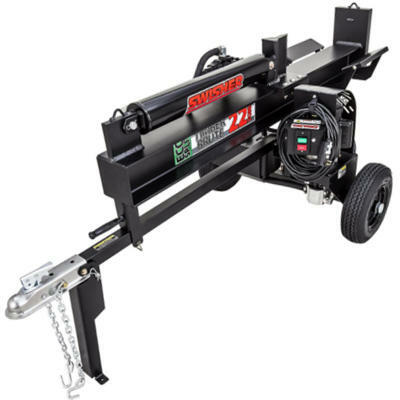 Not only does it provide three times as much pushing power as many other electric (and gas) log splitters on the market, but it does so with a clean cut. It splits the knottiest of wood with little effort, and requires minimal maintenance. Unlike most electric splitting equipment, you can even use this machine vertically or horizontally. The options are endless. You do pay more for this splitter, but you can’t put a price on quality. For this reason alone, we’re happy to review this as one of the best electric log splitters for the money. Check out what other people who purchased this product think about it. Read Swisher LS22E electric log splitter reviews. It has a powerful 3HP motor. It splits very large logs. You can split over 100 logs in less than an hour. The manual is poor for assembly. The guard rails aren’t very durable and bend if a log slips out of place. Some parts are poorly made and aren’t durable. QWhat is the ram travel distance? QWhat is the log cutting capacity? QWhat RPM does it deliver? This Powerhouse electric log splitter represents good buying. It’s powerful, enables you to cut up to 100 logs in an hour, and is quiet to operate. However, it does have its flaws. The manual is very poor so assembly can be difficult, and some components are very poorly made. Based on these facts alone, this Powerhouse log splitter is more suitable for those looking to undertake small splitting jobs, rather than for commercial or industrial use. Check out what other people who purchased this product think about it. Read Powerhouse XM-380 electric log splitter reviews. It’s quite powerful in comparison to its size. It’s very easy to assemble. It’s a good option for homeowners. It’s for sale at an above average cost. It wouldn’t be suitable for commercial or industrial use. If the log isn’t perfectly straight, it will jump off the cutter and could harm the operator or damage the machine. QWhat is the ram’s travel distance? Log splitting machine manufacturer Stark certainly win points for design. This log splitter is very aesthetically pleasing, and it’s nice to see it’s powerful, durable and reliable as well. Although it will not suit commercial or industrial users, it’s a very fitting product for at home. It’s easy to operate, assemble and it’s very quiet. Overall, it’s one of the best electric log splitters for the money. Check out what other people who purchased this product think about it. Read Stark electric log splitter reviews. It doesn’t require much assembly. The stroke limiter makes it faster to cut smaller logs. The log tray holds the logs so they don’t fall to the ground. It’s a very lightweight machine. It’s very well priced on the market for homeowners. It’s difficult to use without the stand. It’s not as powerful as others on the market due to its 5 ton force limit. Dimensions: 40.5 x 17.7 x 39 inches (with stand). QCan it be operated with one hand or two? Although it’s not the most powerful on the market, this YardMax electric log splitter is packed full of features. It offers users exceptional safety components, as well as being suitable for the majority of homeowners. It’s affordable, it’s portable, it’s lightweight and it’s a good option for those with small logs needing split. Check out what other people who purchased this product think about it. 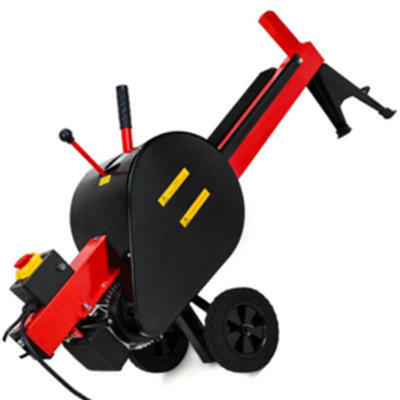 Read YARDMAX electric log splitter reviews. It’s kinetic which allows the energy to build up in the engine for a faster split. It’s on-par in terms of power with a 10 ton hydraulic splitter. It’s compact and easy to store. It’s quite expensive in comparison to others on the market. Generac electric kinetic wood splitter. Dimensions: 24.5 x 11.9 x 49 inches. QHow many volts is it? QHow heavy are the flywheels? If you’re looking for a brand of log splitter that provides a faster cut than most other electric log splitters, this Generac fits the bill. Because the engine gains more power from the kinetic flywheels, cutting time is greatly reduced. It’s also very quiet, easy to transport and is relatively lightweight. It’s higher on the price scale than several other machines, but this can be forgiven due to the incredible output of power. Check out what other people who purchased this product think about it. 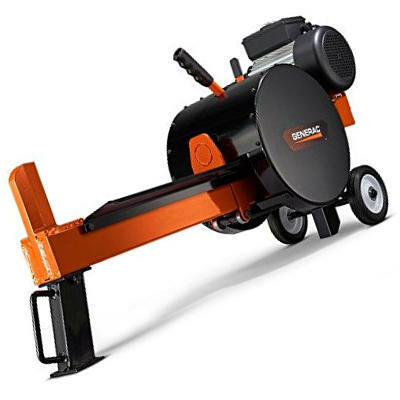 Read Generac K10 electric log splitter reviews. 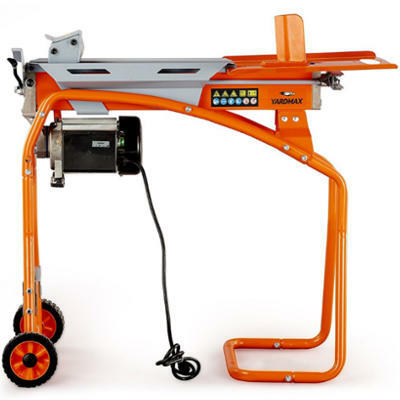 Where to Buy Electric Log Splitters? The beauty of this modern age is how easy it now is to make large purchases online. Amazon is a great platform for reading customer reviews and ensuring the product you’re looking to purchase is top rated and is the right fit for you. Of course, you can still buy electric log splitters and log splitting tools instore. However, you have more options at your disposal and a better chance of getting the best deal when you buy online.